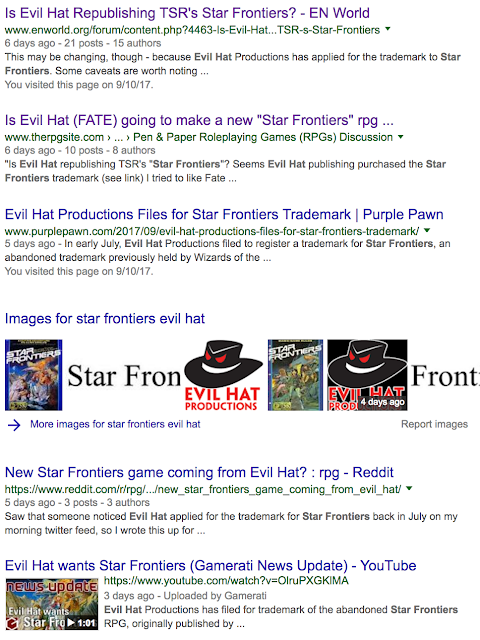 Evil Hat's application for the now abandoned Star Frontiers trademark was all over the net last week (not that I noticed). It reminds me when I found out that the TSR trademark had been snagged - it was an obvious attempt at nostalgia. Is it the same with Evil Hat? Could you clone a game and then use the revived trademark to reissue it? I hope they revive, clone or update the old system, instead of simply releasing a Star Frontier using FATE. FATE has already many good scifi games (I really enjoy Bulldogs, for example). There's a guy out there with written permission from WotC to replicate Star Frontiers, and he appears to be legit....he does it mostly as fan service. Anything involving the Star Frontiers trademark is name-only for Evil Hat, so if they actually use the name it will be for a product (in all likelihood) that is not the thing we grognards associate with the name. I'll believe otherwise should Evil hat formally announce their partnership of license of the IP from WotC. Here's my armchair (non-official, non-legal) advice on this. In the U.S., you can't copyright game rules (although specific text descriptions of rules would be copyrighted). For example, Fate Core is partially a rewrite of the old FUDGE rules. You could do a complete rewrite and then publish the _mechanics_ without issue. Specific intellectual inventions of the old TSR setting (such as the Dralasite, Vrusk, and Yazirian races) would be copyrighted, and the copyright will still be in effect for decades, so that part you can't reproduce unless you licensed them from the IP holder. The Orville TV series that debuted yesterday (which partially clones Star Trek) shows how far you can go in imitating a Sci Fi setting like Star Trek. So you could create an Orville-style homage to Star Frontiers, and have those d100 mechanics, but you'd have to stop short of referencing the specifics of the IP. I'll post links to the online rules as I'm sure of the legality - 100% - as we have letters from WotC allowing us to do so. You can find scans of the original rules and modules at starfrontiers.com and remastered versions at starfrontiersman.com (which also has 25 issues of a fan produced Star Frontiers magazine and some of the modules remastered as well). There is also another active Star Frontiers magazine (21 issues today and the next one coming next month), the Frontier Explorer - at frontierexplorer.org. The concern a lot of fans of the game have is that owning the trademark does not give rights to the existing IP. They could clone/improve the system but without a license from WotC, they couldn't use any of the races or setting that make Star Frontiers distinctly itself. It would have to be something completely new. Thank you for the info but more especially for the hard work that goes into keeping Star Frontiers alive. It's still a great game! So you are saying if one wants the remastered Star Frontiers in print, there's no need to panic and buy up everything from Lulu right now? As far as I know, that is true. I don't actually control the account on Lulu that has the remastered books; that belongs to a previous editor of the Star Frontiersman. However, WotC hasn't said anything and Fred Hicks has explicitly said that if Evil Hat gets the trademark they have no intention of shutting the fan material down (and I stole a page from Eric's playbook and screen captured that tweet to me. :-) ). So for now at least, we should be okay. Plus it can take months or longer for a trademark application to go through. For example, the original trademark application by TSR was filed in Sep 1982, published for opposition in Apr 1983, and finally granted in July 1983. Personally, I found it funny that the internet went crazy about it last week, 2 months after it happened. The delayed reaction amused me. I noticed two days after the filing but of course, I have a vested interest. I had actually looked at what it would take to file for the trademark just the week before Evil Hat filed but decided I didn't have the ready cash or the incentive to do so. I have a nearly unlimited non-commercial license from WotC but without the commercial aspect, it wasn't worth the cash outlay.